Go to Tournaments – 2019 SAF State, Conference & National Championships – Find Mississippi on List – Click Register – Fill in information. 641 Joe Wheeler Brown Rd Fulton MS 38843. Take off will begin at 7:00am or safe light. 1st Flight weigh in will begin at 3:00pm. Rules Meeting to begin immediately after check in. THE TOP 10% OF THE MS HIGH SCHOOL STATE CHAMPIONSHIP WILL ADVANCE TO THE 2019 SAF HIGH SCHOOL NATIONAL CHAMPIONSHIP AT PICKWICK LAKE IN FLORENCE ALABAMA JUNE 18-22, 2019. Creel and Length Limits: 5 fish, Must break 12 inches. $25.00 SAF Membership Required. No Entry Fee Tournament. Logan Main and Steven Miller will represent MS TBF. $25.00 Junior Membership Required. $50.00 per boat entry fee. Team Event. Pay back top three places depending on number of boats. 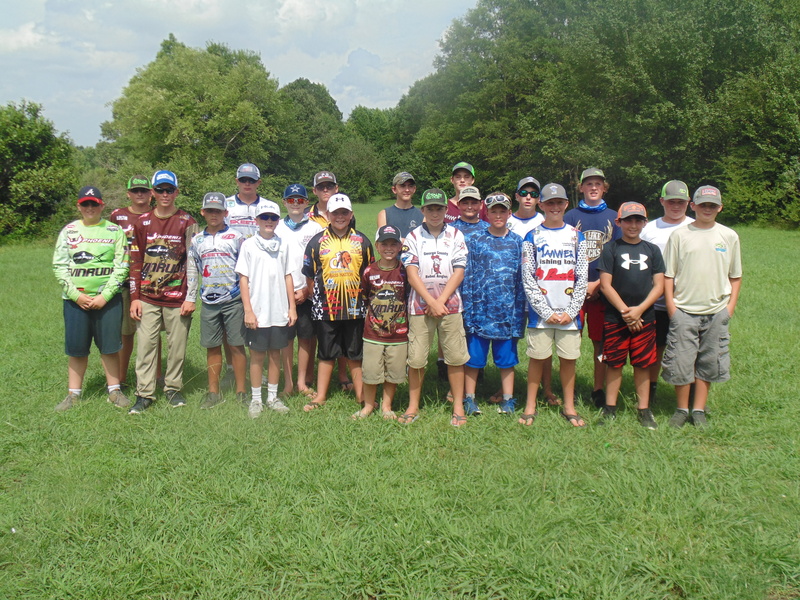 The 2018 MS TBF Junior Championship was held on June 23, 2018 on Columbus Lake in Columbus MS. It was a beautiful day despite a few rain storms for the eleven teams competing. 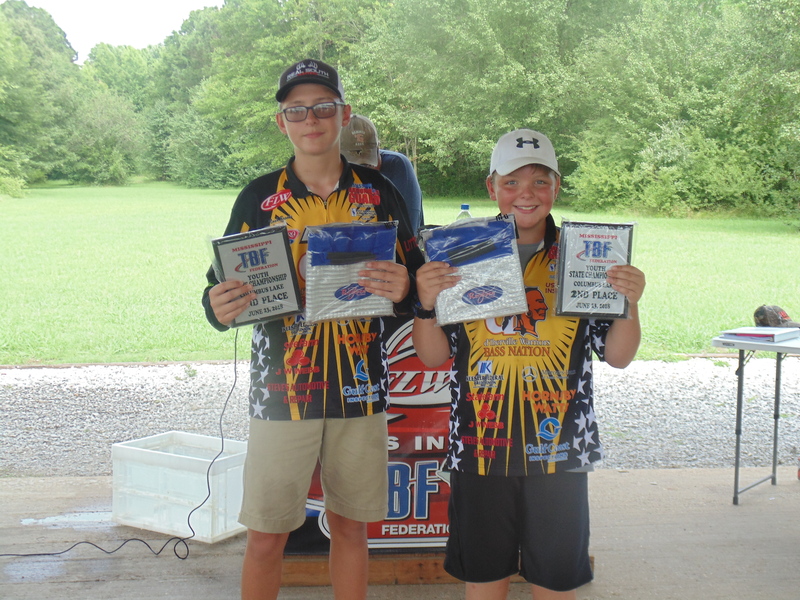 Dawson Jaynes and Fisher Godfrey brought in five bass weighing 25.48 pounds to be crowned the 2018 MS TBF Junior State Champions. The pair also took the Hammer Rod Big Bass Award with a 9.38 pound lunker. 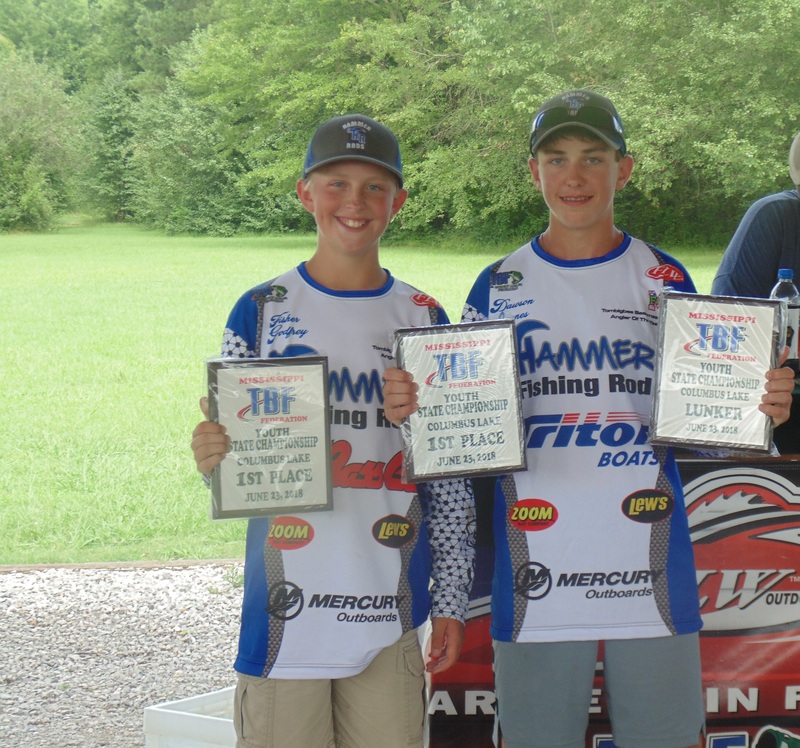 Dawson and Fisher will represent MS TBF at the 2018 Junior World Championship August 9-11, 2018 on Lake Hamilton at Hot Springs AR. Coming in 2nd was Noah Brooks and Tucker Brooks with five fish weighing 11.66 pounds. 3rd place was Reed White and Tyler Alvis with five fish weighing 11.08 pounds. 4th place was Calup Williams and Phillip Herring with four fish weighing 9.82 pounds. 5th place was Blake Duncan and Ayden Gideon with three fish weighing 6.88 pounds. 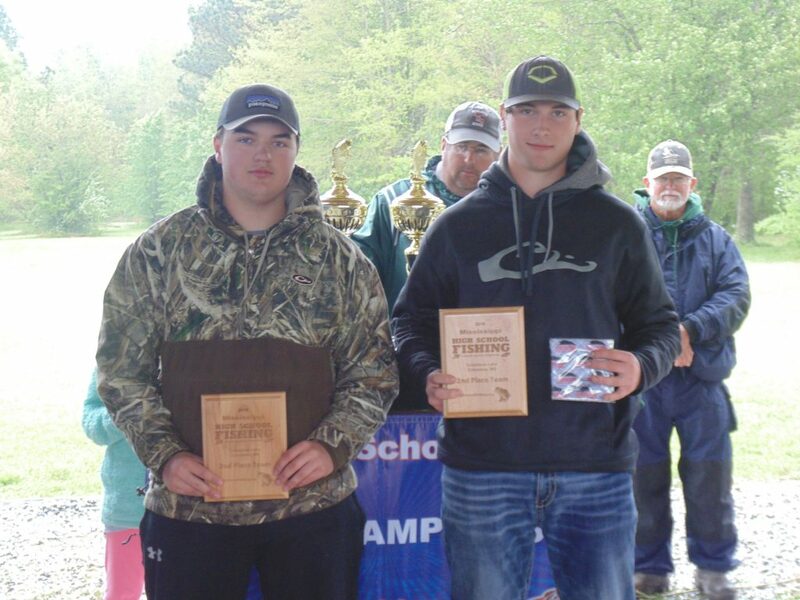 6th place was Drew Gideon and Andrew Stoddard with three fish weighing 5.92 pounds. 7th place was Ty Goff and Brieson Southern with three fish weighing 5.40 pounds. 8th place was Dillon Hesterman and Dylan Erkhard with three fish weighing 5.24 pounds. 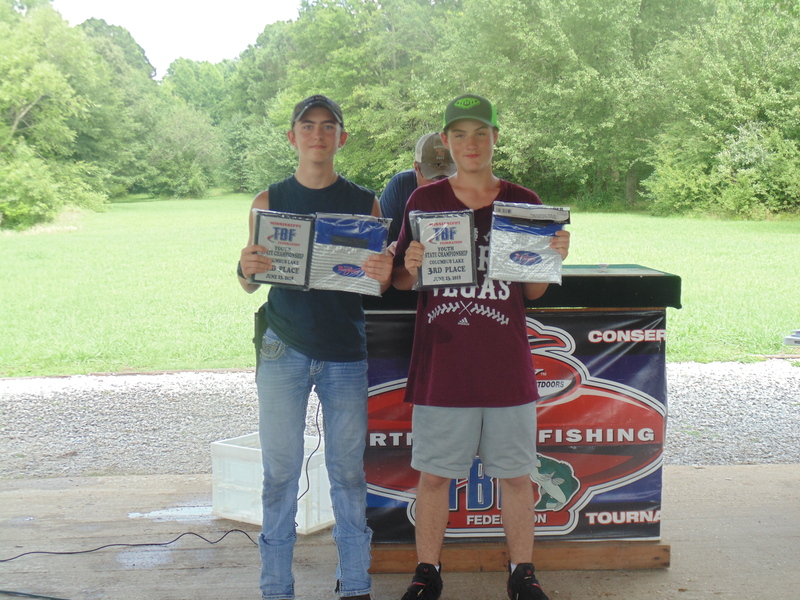 9th place was Jackson Walters and Kenneth Thomas with one fish weighing 2.68 pounds. 10th place was Brady Gaskin and Dax Lewis with one fish weighing 1.96 pounds. 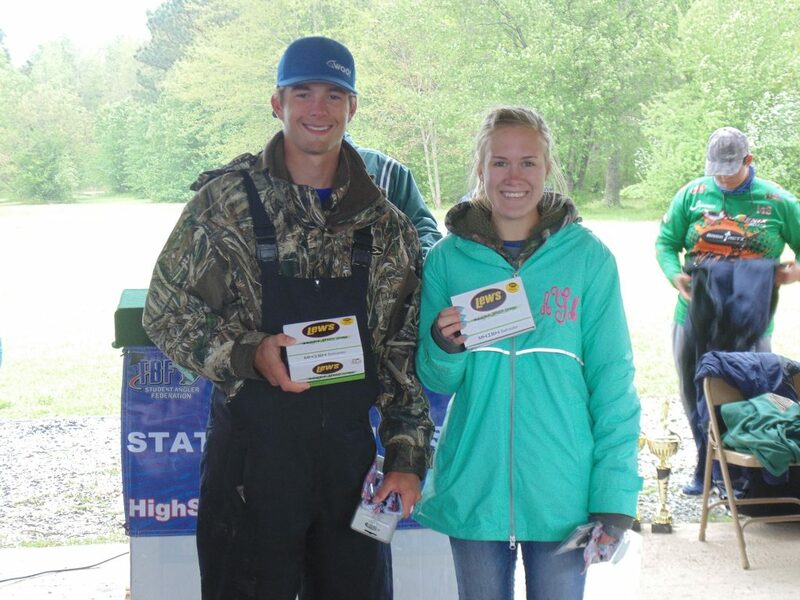 11th place was Chase Carr and Anstin Knowles with one fish weighing 1.80 pounds. We want to extend a big Thank you to our sponsors, parents, and boat captains. 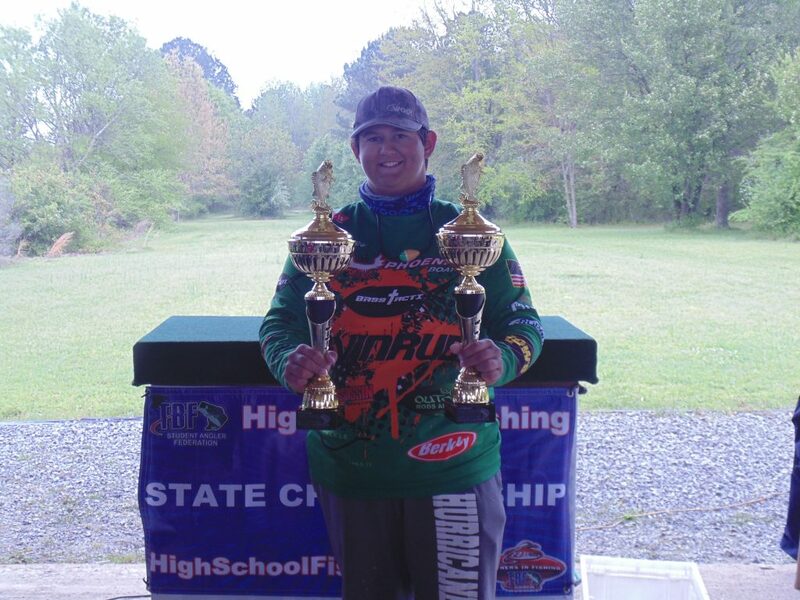 The MS TBF SAF High School State Championship was held on April 7, 2018 on Columbus Lake, Columbus MS. It was a tough day of fishing for the 37 teams combined with bitter cold temperatures and high winds. 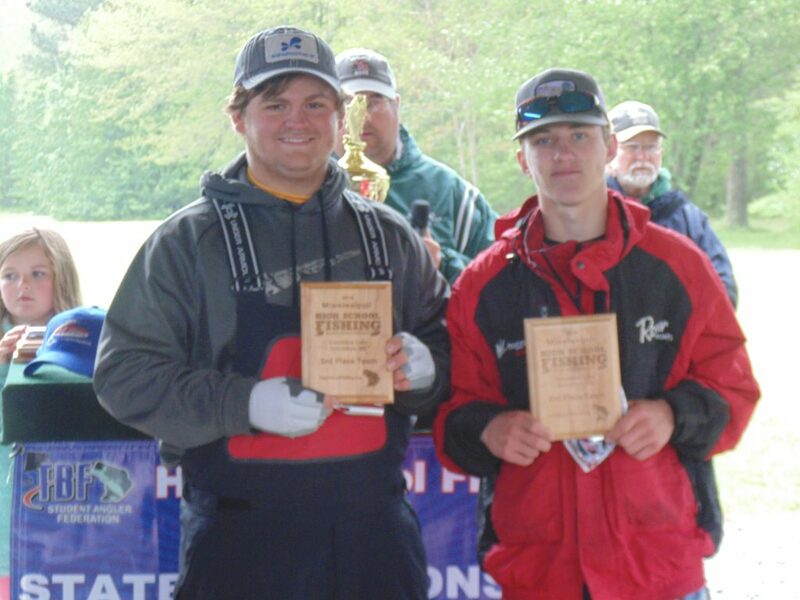 James Willoughby and Ashton Saucier of the West Harrison High School Hurricanes Fishing Team brought in five bass weighing 14.04 pounds to be crowned 2018 Mississippi High School Fishing State Champions. Coming in second place was Drew Lockhart and Easton Higginbotham from Amory High School with five fish weighing 13.06 pounds. Third place went to Brandon Bell and John Cox from Starkville High School with five fish weighing 11.82 pounds. 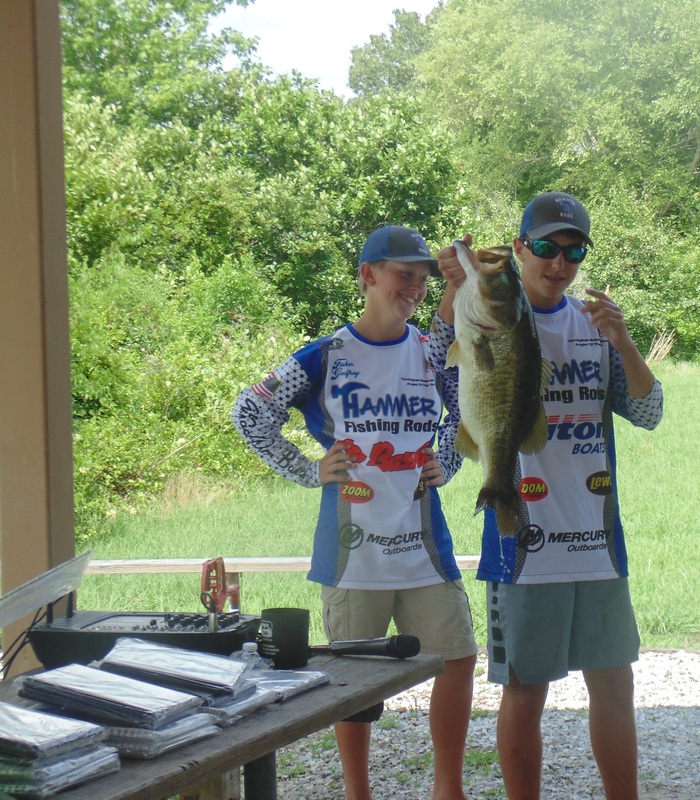 Fourth place went to Garrett McWilliams and Addison Yates from Discovery Christian School with four fish weighing 10.84 pounds they also won the Lew’s Big Bass Award with a 4.54 pound big bass. The top three teams will advance to the 2018 National Championship to be held June 25–30, 2018 at McFarland Park, Pickwick Lake in Florence Alabama. We want to extend a big Thank You to our Sponsors and The Columbus Convention & Visitors Bureau. © 2019 Mississippi Bass Federation.